A week after a man reported suffering a painful sting by a jellyfish near Tices Shoal, a popular boating anchorage off Island Beach State Park, a group of researchers found more than 40 clinging jellyfish, a dangerous non-native species that has been expanding its presence in the Shore area this season. 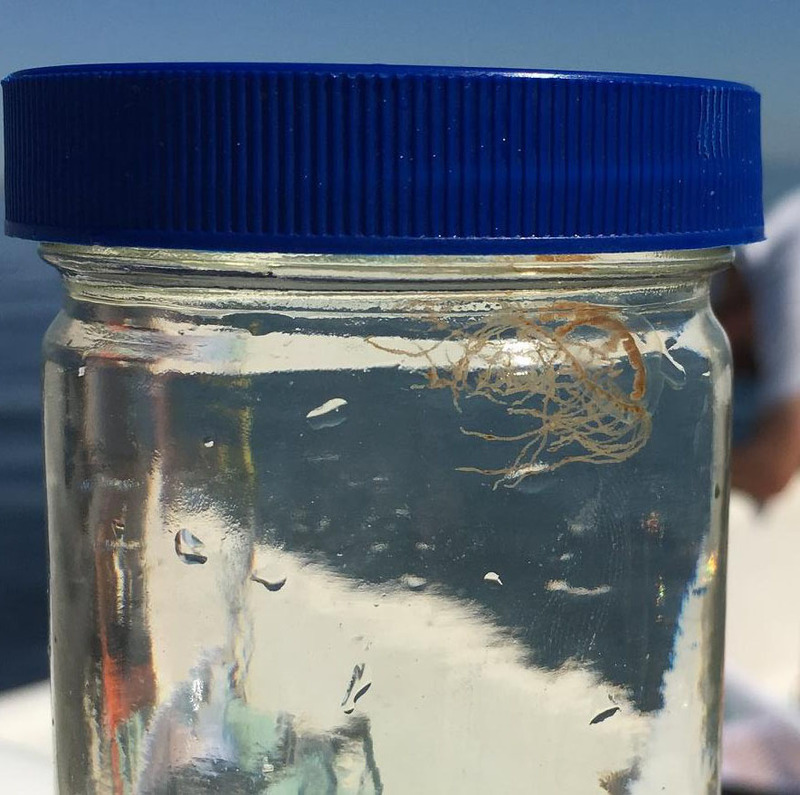 Dr. Paul Bologna of Montclair State University has been leading the state’s research into clinging jellyfish, working with the Department of Environmental Protection to track the species. Bologna said his team found more than 40 clinging jellyfish during a search of Tices Shoal in recent days. More alarmingly, two swimmers were reportedly hospitalized after being stung over the weekend. Neither person’s injuries were life threatening but high-dose painkillers had to be administered to provide relief. Clinging jellyfish have occasionally been found in New Jersey, but were first seen in statistically significant numbers two years ago, mainly in Monmouth County. But so far this year, Bologna’s team has found the dime-sized creatures in the Metedeconk River and Barnegat Bay. Some were found outside the entrance to F-Cove in Brick, perhaps the second most popular boating hangout next to Tices. The clinging jellyfish, a native to the Pacific Ocean, is small and very difficult to spot in the water. A sting can produce severe pain and other localized symptoms and can result in hospitalization in some individuals. It is called a “clinging” jellyfish because it survives by clinging to the edges of plants and aquatic vegetation. The species is only found in rivers and bays; it cannot survive in the ocean surf. The bay floor at Tices Shoal is a mix of sand and vegetation-covered sand. The south end of the area and the western edges of the shallow water are the most vegetated areas, while the shallowest sand bars and interior generally have a sandy bottom. The clinging jellyfish is much smaller than the sea nettle, a more common species that is little more than a nuisance. Sea nettles, which produce a less powerful sting, are common in Barnegat Bay but are much larger. The good news, officials said, is that they prey on clinging jellyfish. The clinging jellyfish ranges from the size of a dime to about the size of a quarter. It has a distinctive red, orange or violet cross across its middle, but is notoriously difficult to visibly spot in the water. Environmental officials are seeking the public’s help in tracking clinging jellyfish, but caution is required, they said. If you see a clinging jellyfish, do not try to capture it. Take a photograph if possible and send it to Dr. Paul Bologna at bolognap@mail.montclair.edu or Joseph Bilinski at joseph.bilinski@dep.nj.gov along with location information.